My second edition of the 'My Favourite Polish' series. Today is going to be focused on... GLITTER! Now, to me, my subsection of "glitter" means that I need to put these polish on top of other polish.. Some polish contains glitter with a fairly opaque base and is okay without a base colour first.. so.. that is how I determine whether a polish is a glitter or not.. Yup. Here are my top 10 favourite glitter polish - in no particular order! OPI Glow Up Already - I have never actually posted a photo of anything I have done with this gem. How awful! It is a full out glitter gem with mostly greenish-gold toned glitter. And it is wonderful! I did like most of the glitters released in the Burlesque collection - but this one is definitely my favourite! China Glaze CG In The City - Another polish that I haven't really posted using.. what is going on with me?! This is purple-y and silver-y and exquisite. OPI Teenage Dream - All right. Another that I didn't post any looks using. WOW! This is making me seem like a complete fraud. 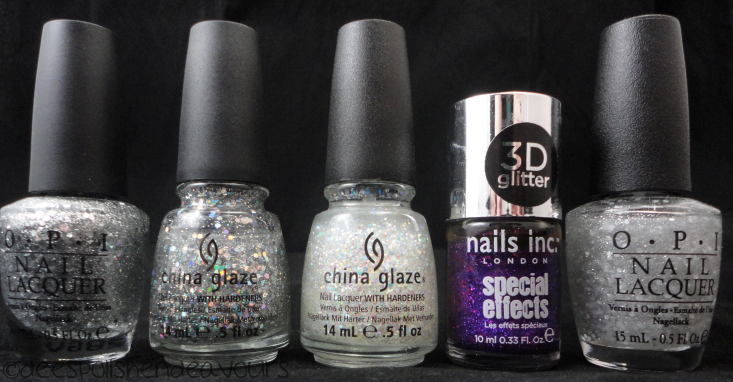 I promise that I really do love these glitters! This one is pretty and pink and the name of my favourite Katy Perry song. I need to get to work and post up some manis using these gems, and FAST! Wet n Wild Back Alley Deals - Purple and fuchsia glitter. Enough said. Nails Inc Connaught Square - This is a perfect glitter for galaxy nails! It is 3D and gorgeous! That is all. OPI Crown Me Already! - Ok. When I think "glitter", I always think of silver glitter. This is the ultimate silver or silver on silver. It was the polish that I based my New Years nails on last year. Very pretty and very silver! China Glaze Techno - This is another I don't have any posting for.. What have I been doing? Not taking photos for you all. This is AWFUL! Again, silver glitter with holographic silver glitter. It is just very, very pretty! A great addition to my collection. China Glaze Snow Globe - Aptly named. It is seriously like the snow globe flakies.. perfect for Christmas themed manis or just for the 'something extra' touch to a single polish mani. Nail Inc Bloomsbury Square - This is the other 'perfect for galaxy nails' glitter. I love it for that reason alone. OPI Pirouette My Whistle - This is going to sound strange, and I feel weird writing it - but this is a delicate glitter. Two words that shouldn't really go together. I mean, glitter, to me, usually means IN YOUR FACE! But this one is so subdued and innocent. It really is perfection. 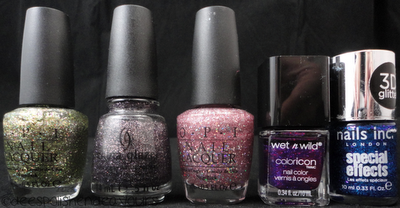 That is it for my top 10 glitter polish - what is your favourite glitter polish? Or even your top 10?! I'd love to know! !